Kitsap County is known for its spectacular beauty and bountiful attractions. 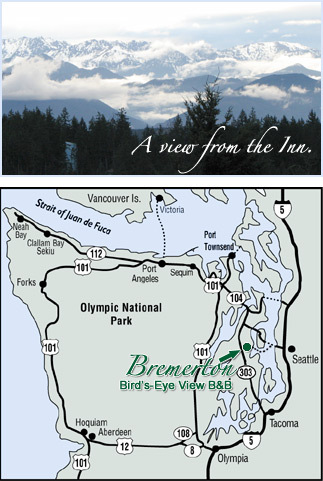 Guests receive complementary guest passes to the Bremerton Tennis and Athletic Club, which is only a half mile from the Inn. Enjoy tennis, racketball, cardio and weighs plus the swimming pool. Enjoy one of our community events, visit www.visitkitsap.com/events to see what's happening during your stay. Watch a Kitsap Blue Jackets baseball game. Tour the USS Turner Joy on the Bremerton waterfront. The USS Turner Joy is a refurbished Vietnam-era destroyer that is now a floating museum operated by the Bremerton Historic Ships Association. Moored at the north end of the Bremerton Boardwalk, the ship can be explored topside and below decks. The tour also includes a Vietnam POW memorial. Golf at McCormick Woods, Gold Mountain, Rolling Hills, White Horse or Trophy Lake golf courses. View www.visitkitsap.com to learn about other area golf courses. Experience a Native American folklore show at Tillicum Village. Take the ferry to Seattle to see the ballet and other Seattle attractions. Take a day trip to Hurricane Ridge or the Hoh Rain Forest on the Olympic Peninsula. Explore the Keyport Naval Undersea Museum. Take the Olympic Peninsula wine tour. Visit the Olympic Game Farm. Experience The Zone Sportsplex - A huge year around climate controlled multi purpose sports facility for baseball, softball, soccer, lacrosse, flag football and an indoor golf driving range! Enjoy a scenic boat trip aboard Kitsap Harbor Tours. Bremerton Harborside and Louis Mentor Boardwalk Stroll along the Louis Mentor Boardwalk to enjoy some of the best views in the county. The Harborside is located right next to the ferry terminal along beautiful Sinclair Inlet. You'll enjoy the playful fountains, wide plaza and relaxing gathering places as you watch ferries, sailboats and wildlife. Elandan Gardens The simple pleasure of Bonsai trees over one thousand years old await you at Elandan Gardens. Kitsap County Historical Society Museum has one of the finest collections of historic photographs in the area. Museum exhibits include a model of a logging camp and scale models of typical early storefronts in the town.